Read this testimony in PDF. In recent years, few trends in state fiscal policy have been as pronounced as the drive to generate additional funding for transportation infrastructure in the face of dwindling revenues. ITEP has studied the erosion of state and federal transportation funding in great detail and I am thankful to have this opportunity to share my organization’s research with the Task Force. This brief outlines the causes of Louisiana’s infrastructure revenue shortfall and offers recommendations for how the state can achieve “sufficient increased levels of recurring funding to address the transportation backlog in highway and bridge maintenance needs in Louisiana,” as per the Task Force’s mandate. 1. Increase the gas tax to offset purchasing power lost since 1990. A 19 cent increase would raise roughly $576 million per year and would fully offset the 47% decline in purchasing power caused by inflation and vehicle fuel economy gains since 1990. 2. Join 19 other states in implementing a variable-rate gas tax in order to prevent further decreases in the tax’s purchasing power. The approach taken in Georgia, where the tax rate is designed to rise alongside changes in both inflation and vehicle fuel economy gains, is the most sustainable option available. 3. Pair gas tax reform with an increase in the state’s Earned Income Tax Credit (EITC) to offset the disproportionate impact of the gas tax on low-income families. The following comments offer further detail regarding each of these recommendations. Louisiana has the tenth lowest gasoline tax rate in the nation. The tax rate has not been increased since January 1, 1990. Only five states have waited longer than Louisiana since last raising their gas tax rates. 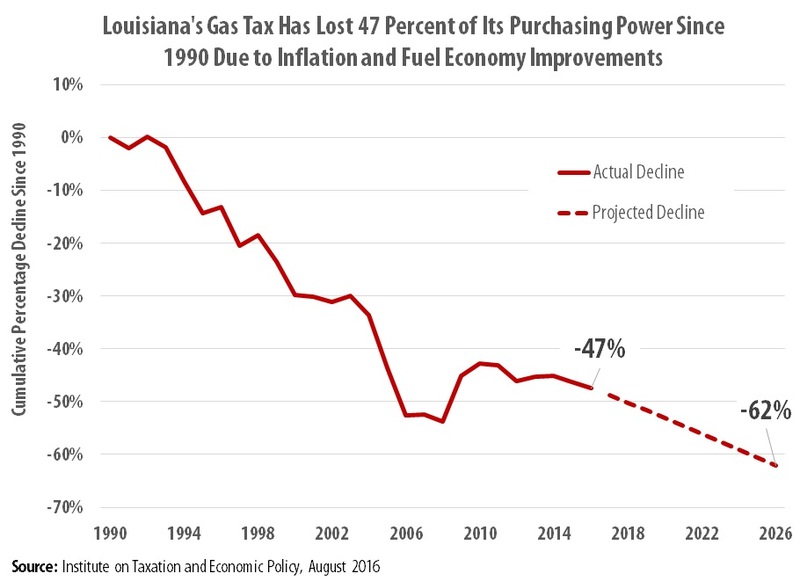 Louisiana’s gas tax is failing to raise a sufficient level of revenue over time because of two factors. First, inevitable growth in the cost of infrastructure maintenance and construction (currently 62.3 percent higher than in 1990) has reduced the amount of work that can be funded with each dollar raised by the gas tax. Second, growth in gas tax collections per mile driven has slowed due to improvements in vehicle fuel economy (up 17.2 percent since 1990, from 18.9 to 22.1 miles per gallon) that have allowed drivers to travel further—and produce more wear-and-tear on the roads—for each gallon of gas they purchase. These two factors have reduced the total purchasing power of Louisiana’s gas tax by 47 percent since 1990. In total, that decline reduced state revenue collections by $8.3 billion between 1990 and 2016—including an expected reduction of $545 million in 2016 alone. That $8.3 billion represents revenue that would have been collected if lawmakers had gradually raised the state’s gas tax rate to compensate both for inevitable growth in the cost of maintenance and construction, and for the revenue-reducing effects of improvements in vehicle fuel economy. Reversing the decline of Louisiana’s gas tax would require immediately raising the state’s tax rate by 19 cents—from 20 to 39 cents per gallon. Implementing an increase of this size could be expected to raise $576 million in 2017. But a one-time increase to the state’s gas tax rate is not a long-term funding solution. To generate sustainable gas tax revenues in the medium- and long-term, Louisiana should follow the lead of nineteen other states that have abandoned their fixed-rate gas taxes in favor of more sustainable, variable-rate taxes. Absent such a reform, Louisiana’s gas tax will not be able to generate sustainable revenues in the face of predictable improvements in vehicle fuel economy and inevitable growth in the cost of infrastructure maintenance. In most cases, variable-rate gas taxes include an “indexing” provision where the gas tax is allowed to grow via regular adjustments (usually once per year) in the tax rate. Florida, for example, allows most of its gas tax rate to rise each year according to the rate of general inflation. In North Carolina, the tax rate is adjusted automatically based on population growth and energy prices. But the formula adopted by Georgia last year—tying the tax rate both to improvements in vehicle fuel economy and to growth in the cost of infrastructure maintenance—is the most sustainable option available. Adopting an indexed tax rate similar to Georgia’s would result in modest, incremental growth in Louisiana’s gas tax rate over time. Indexing the state’s current gas tax rate would result in tax rate increases of less than 1 cent per gallon, per year, through the next decade. If the state’s tax rate were raised to 39 cents prior to implementing indexing, tax rate increases brought about by indexing could be expected to remain below 2 cents per gallon, per year, throughout the next decade. If Louisiana lawmakers opt to neither raise nor index the state’s gas tax rate, current projections suggest that the tax will have lost 62 percent of its value by 2026. At that point, the state will be forgoing $926 million in revenue each year relative to what the state’s “real” tax rate as of 1990—adjusted for inflation and fuel economy growth—could have generated. The need for gas tax rate indexing will only grow in the years ahead. While there is no way of knowing how quickly construction costs will grow in the future, it is clear that gains in vehicle fuel economy will continue to accelerate as new corporate average fuel economy (CAFE) standards are implemented. Whereas light duty vehicles’ average fuel economy improved by just 8.2 percent between 2006 and 2016, the best available projections suggest that fuel economy will improve by 28.6 percent between 2016 and 2026. These improvements in vehicle fuel economy are unlikely to be accompanied by a large increase in the popularity of electric vehicles in the near future. The Energy Information Administration (EIA) estimates that fully electric vehicles currently account for just 0.4 percent of new vehicle sales in the region. That figure is expected to remain below 2 percent throughout the next decade. While gas tax reform will not generate any revenue from this relatively small group of drivers, raising vehicle registration fees for electric vehicles can help to ensure that these drivers contribute to funding the state’s infrastructure. Finally, it is important to recognize that increasing Louisiana’s gas tax will have a disproportionate impact on low- and moderate-income families because these groups tend to spend a larger share of their incomes on gasoline. A 19 cent per gallon gas tax increase would collect 0.3% of the income of Louisiana’s lowest income taxpayers, compared to less than 0.1% of income for high-income families. Targeted tax reductions such as an increase in Louisiana’s Earned Income Tax Credit (EITC) could help offset some of the gas tax’s impact on those families least able to afford the tax. Increasing the EITC from 3.5 to 7 percent of the federal credit, for example, could offset much of the impact on lower-income families at a cost of roughly $48 million—less than 10 percent of the amount raised by the associated gas tax increase. Thank you again for the opportunity to submit these comments. ITEP staff are happy to provide the Task Force with additional information on this topic upon request. American Petroleum Institute. “State Motor Fuel Taxes: Rates Effective 7/1/2016.” July 2016. Available at: http://www.api.org/~/media/Files/Statistics/State-Motor-Fuel-Taxes-Report-July-2016.pdf. Institute on Taxation and Economic Policy. “How Long Has it Been Since Your State Raised Its Gas Tax?” June 2016. Available at: https://itep.org/itep_reports/2016/06/how-long-has-it-been-since-your-state-raised-its-gas-tax-1.php. ITEP analysis of the Federal Highway Administration’s (FHWA) Bid-Price Index (BPI) and National Highway Construction Cost Index (NHCCI) for 1990 to 2015, plus an assumption of 1.0 percent growth in construction costs in 2016. ITEP analysis of data from the FHWA and projections from the Energy Information Administration (EIA). These figures refer to the actual on-road performance of all light duty vehicles in operation in a given year. ITEP analysis using data from the FHWA and EIA. Assumes the sale of 3,031,541,685 taxable gallons of motor fuel in 2017. These figures refer to the actual on-road performance of all light duty vehicles in operation in a given year. Data from 2006 to 2014 come from the FHWA while 2015 to 2026 projections are from the EIA’s 2016 Annual Energy Outlook. ITEP analysis of EIA projections for sales of electric and fuel cell light duty vehicles for the West South Central region, consisting of Arkansas, Louisiana, Oklahoma, and Texas. National Conference of State Legislatures. “State Efforts Promote Hybrid and Electric Vehicles.” December 2015. Available at: http://www.ncsl.org/research/energy/state-electric-vehicle-incentives-state-chart.aspx. Estimate produced using the ITEP Microsimulation Tax Model. These figures compare the impact on the 20 percent of Louisiana residents with the lowest incomes to the impact on the top 5 percent of earners in the state. ITEP Microsimulation Tax Model, August 2016.